Power your language - weed out the weak words! Home » Blog » Influencing skills » Power your language – weed out the weak words! How do you as a listener react to a speaker opening like the above? Does s/he sound convincing? Why not? Because it is full of weak language. Weak language is any word (or sound) that doesn’t add value to your message. 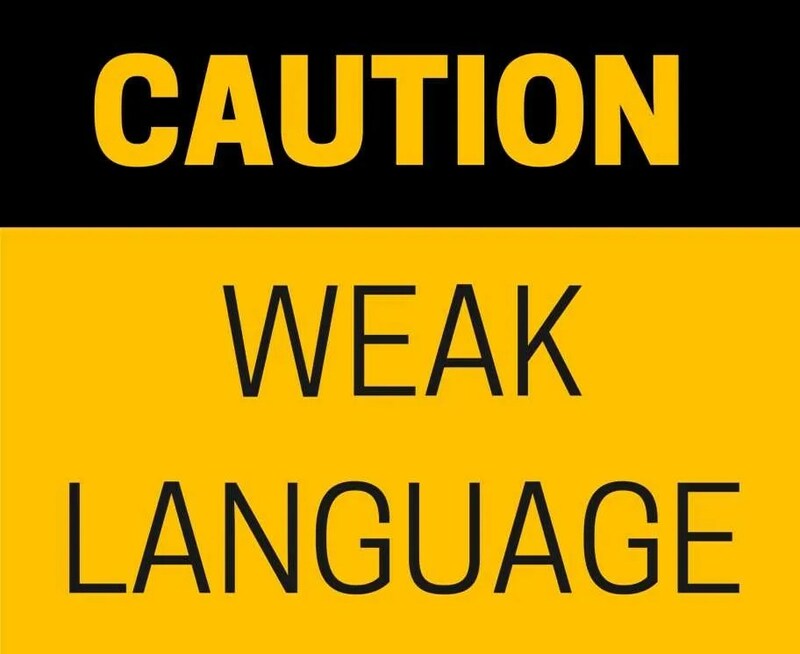 But not only does weak language not add value – it dilutes and undermines your message. Uhm, basically, yeah, literally, kind of, like..
Filler words pop out or mouth when we don’t know what to say next. We also use them to protect us from the discomfort of silence. Think before you speak. Pause (your body language needs to show that you are not done yet to stop the audience from interrupting you). Ask a friend or a colleague to be your “filler word police”. I may be wrong .. but..
To hedge in language is to hide behind words and refuse to commit oneself. Hedges share two defects: they sound as you doubt your own words and they lengthen your sentences unnecessarily. Stringing together several sentences by and or but makes it hard for the listeners to get your message. If you often get out of breath when speaking, this might be one of the causes. Speak in short sentences, emphasizing the key words and ending with a falling inflection. You will have time to breathe and think about your next sentence. The audience will have time to digest what you just said. Rather, very, quite, usually, generally, more, less, least, so, just, enough, indeed, still, almost, most, fairly, really, pretty much, even, a bit, a little, a great deal. Often, qualifiers provide unnecessary padding to your message. We qualify too much because we are seeking attention, because we lack precise words to express ourselves, or because we think it sounds better. A tag is a short question added to the end of a statement. This is the best proposal, isn’t it? …, you see what I’m saying? While the sentence preceding the tag is a clear statement of fact, the tag turns it into a question or a doubt. There are also non-verbal versions of tags: A shoulder shrug, a nervous laughter, or a rising tone at the end of a sentence. Like verbal tags, they indicate doubt, submission or a will to please others. Simply remove the tag, ending your sentence on a falling inflection and with a confident smile. The message has now gained in clarity and assertiveness – using only half as many words! As summer is here, now is the perfect time to start weeding your language, trimming your hedges, and nurturing your credibility.